Ethics. They’re what drive your business forward and highlight what you’re about. They dictate what type of conscience you have, both as a business owner and an individual person. So what are your ethics saying about you? Take a company that values honesty and integrity. Would you expect them to lie to you and work in an underhand way? No, because if they did, it would feel wrong for them and for you, as you’d feel an incongruency between their words and their actions. If you had a Fairtrade company paying workers less than minimum wage or using child labour, you’d be up in arms. DON’T take credit for work you haven’t done – whether it’s an image you’re using but not correctly crediting to the photographer or a blog post you’ve copied straight off the internet. DON’T lie about what you can and can’t do – if you’ve helped twenty people, say twenty, not one hundred. NEVER approach or try to steal clients from others – regardless of whether you think you’ll be able to do a better job with them. NEVER become so focused on the money, you lose sight of being of service and helping your clients, to the best of your ability. ALWAYS refer clients to the BEST person for them – regardless of how this affects your bottom line. ALWAYS treat others in your profession (in fact, in all professions), with courtesy and respect. Let’s play a word association game. I’ll give you a word and I want you to say the first thing that springs to your mind. Ready? The word is… salesperson. If you’re in the majority, the words that you will immediately associate with ‘salesperson’ are any (or all) of the following – sleazy, pushy, money orientated, commission focused and salesy. We think they step over others to get the sale, will tell us whatever they need to, in order to get us to take out our wallets and use others as a stepping stone in their personal career aspirations. Now before you tell me I’m being harsh, I’m focusing on the worse possible examples. I know there are some really great heart-based salespeople out there, some of which I know personally – and these words are so far removed from who they are and what they’re about – but we’ve all heard horror stories of dealing with a ‘nightmare salesperson’. How about I give you a new word, for this word association game – insurance salesman. What about ‘traffic warden’, ‘reporter’, ‘coach’ or ‘virtual assistant’? What kind of words do you automatically associate with them? Again, I’m sure we all know someone in each of these niches that truly are lovely people. Unfortunately, it only takes a couple bad apples to turn the whole barrel and effect the perception of the profession as a whole. What this little word association game highlights is how important reputation is in business – and your personal and business ethics are what shine the light on your reputation. This game highlights the words we automatically associate with specific niches, words that are seen as the ‘norm’, before we’ve even started looking at the ethics of the individual company in those niches. What we need to be working towards is raising the standards of ALL niches and professions, so we can ALL hold our heads that little bit higher and be proud of what we do, how we earn our money AND who we are, whether we’re at work or at home. 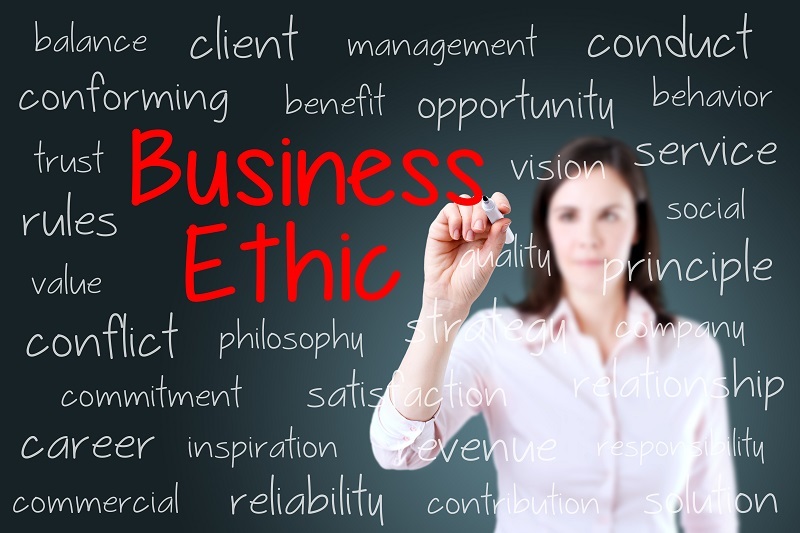 Have you taken an honest look at the ethics you use in business? When was the last time you gave them an overhaul? Why not take time out to get clear on what you really stand for and see how you can better implement it in your business?